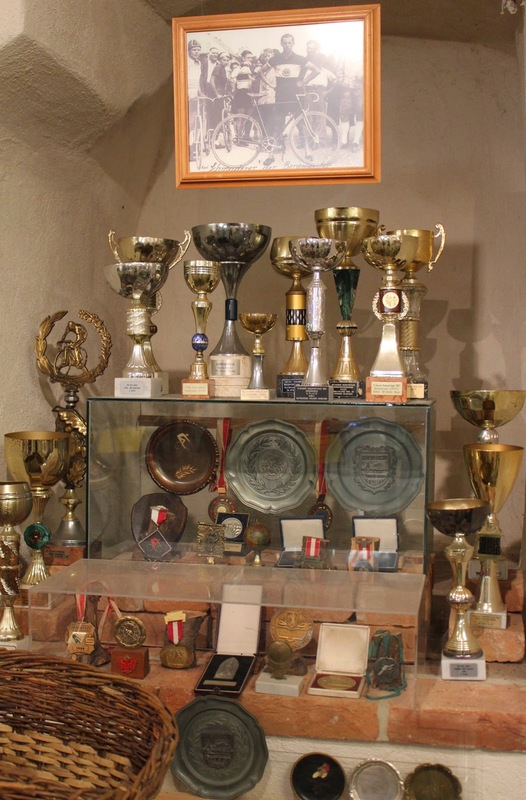 The world of cycling is truly diverse, encompassing sports, transportation, technology and social history. Set at a human scale, many of its stories and artifacts have been lost over the last century but much too has been saved. 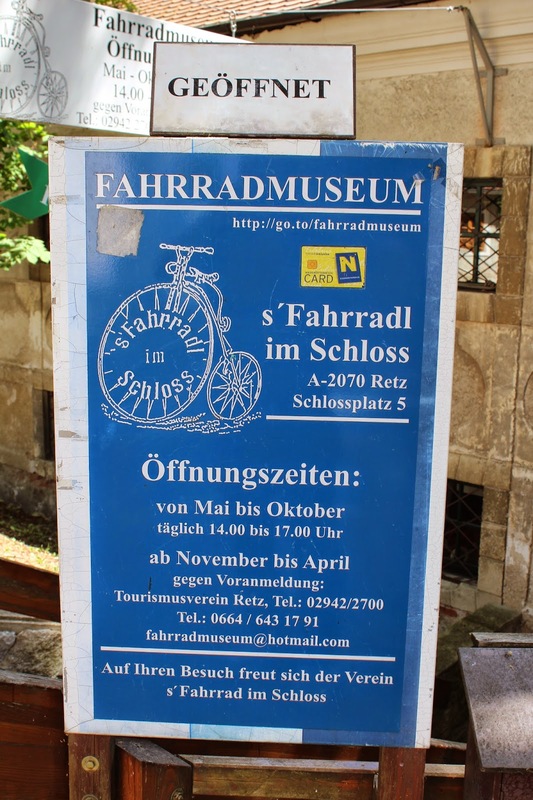 In Europe many of the mainstream state museums, such as transportation wing of the Deutsches Museum in Munich, give short shrift to the two-wheeled past but one finds a surprising number of rather eccentric little museums heroically taking up the slack. 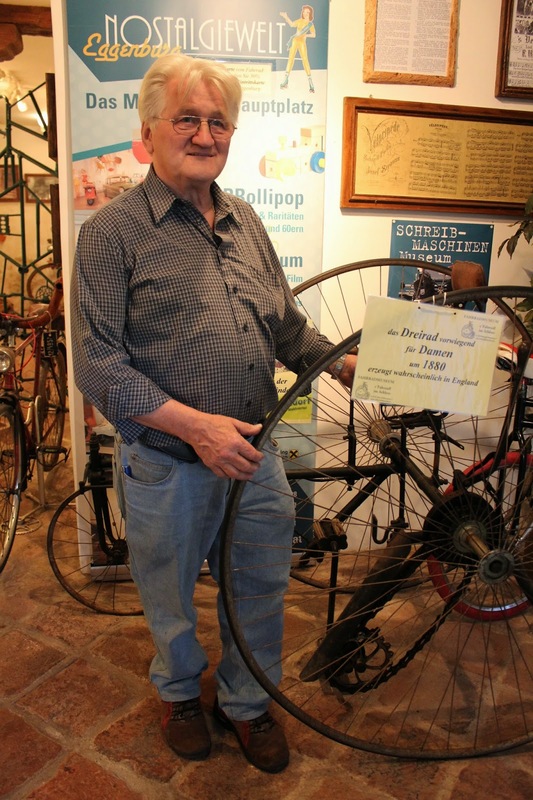 Pezcyclingnews has already taken you to museums in Belgium, Switzerland, the Netherlands, Italy and Germany but today we introduce you to yet one more, this time in Austria. Retz is a town of 5,000, located in Lower Austria directly on the Czech border and some 80 kms northwest of Vienna. 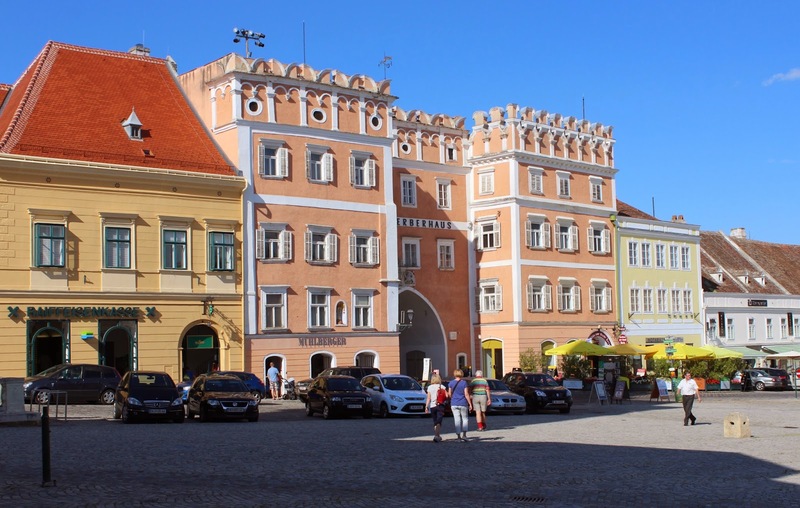 Dating back to 1180, the town has has seen its fair share of events, including being destroyed during the Hussite Rebellion in 1425 and then again in the 17th Century during the Thirty Years' War. Located in the Austrian Wine District (Weinviertel) it boasts one of the finest and largest market squares of any place in the country and the Gatterburg Castle, constructed between 1660 and 1670. 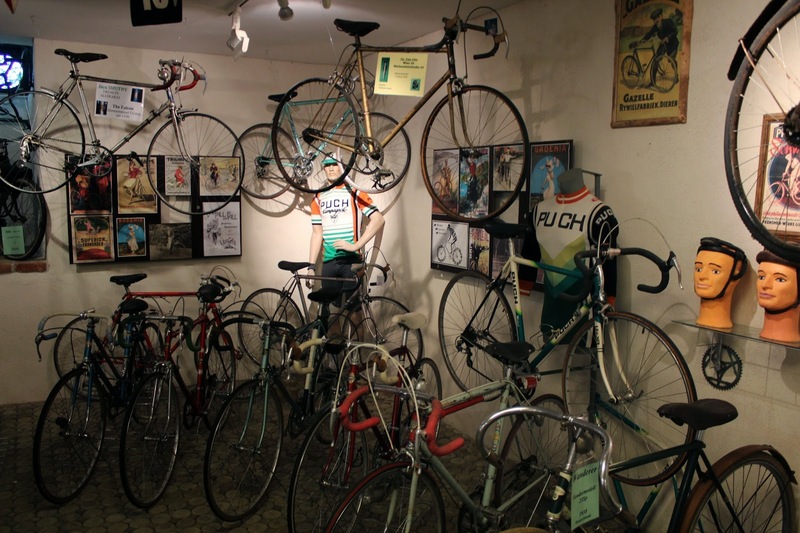 In the basement of this city castle you will find the Fahrradmuseum Retz (simply “the Retz Bicycle Museum”) and its jovial proprietor/manager, Herr Fritz Hurtl. Austria was of course once much more than Austria alone, ruling over a vast multicultural and multilingual empire until 1918 so it should be no surprise that the country once boasted a significant industrial base which included the manufacture of bicycles. 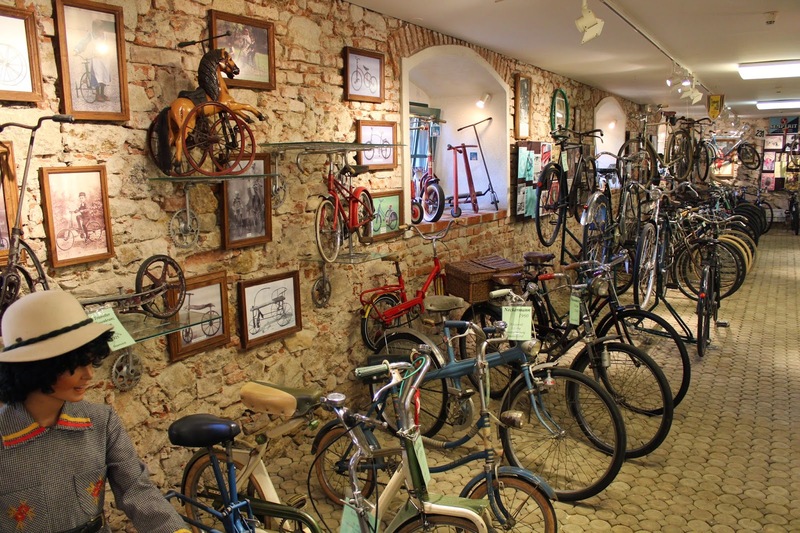 In its collection numbering more than 90 examples the Retz museum covers the history of the bicycle from the days of the hobby horse/Laufmaschine craze of the 1820s up to racing bicycles of the 1980s with a particular emphasis on Austro-Hungarian brands. Some of these names still resonate even in the English-speaking world of models exported in the bike boom of the 1970s: Puch, Steyr, Austro-Daimler. 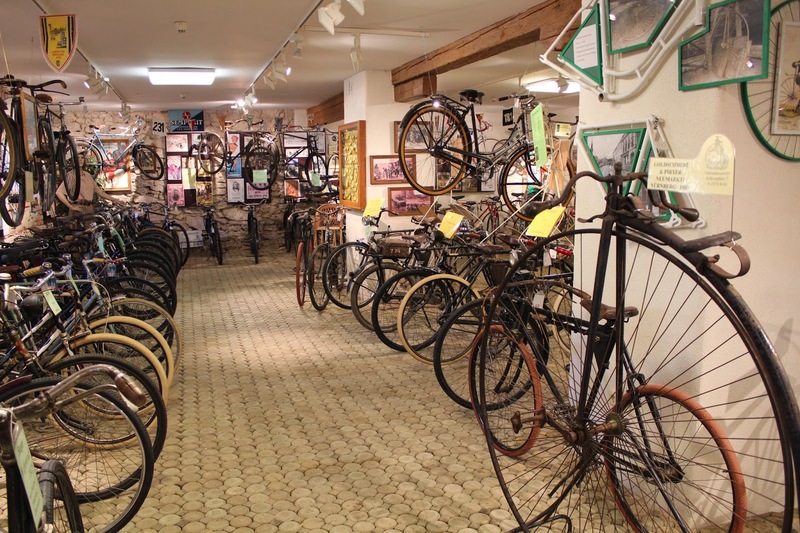 The basis of what you see in the museum, which includes not only complete bicycles but also accessories, pictures, advertising posters and parts, came from the collection of Herr Hurtl. With a band of supporters an association was formed and space was found in the castle cellar. In 1999 the museum was opened to the public and operates daily in the afternoon from May to October. Herr Hurtl is a great enthusiast and is delighted to discuss the finer points of the collection (although visitors may wish to note he does not speak English and his German bears a very strong Austrian dialect!). He was concerned that the museum may have to eventually relocate, something that seems to be a common problem for these small museums. 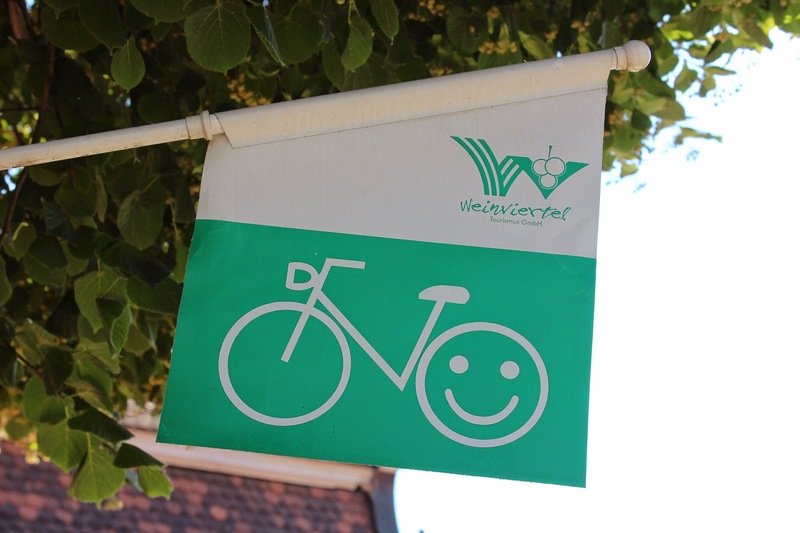 The lease with the castle landlord was due to end in 2013 but is continuing for the moment but the association, “Verein 's Fahrradl im Schloss," would like to have a permanent location of its own. The current space is not wheelchair-accessible and lacks space for special exhibitions. 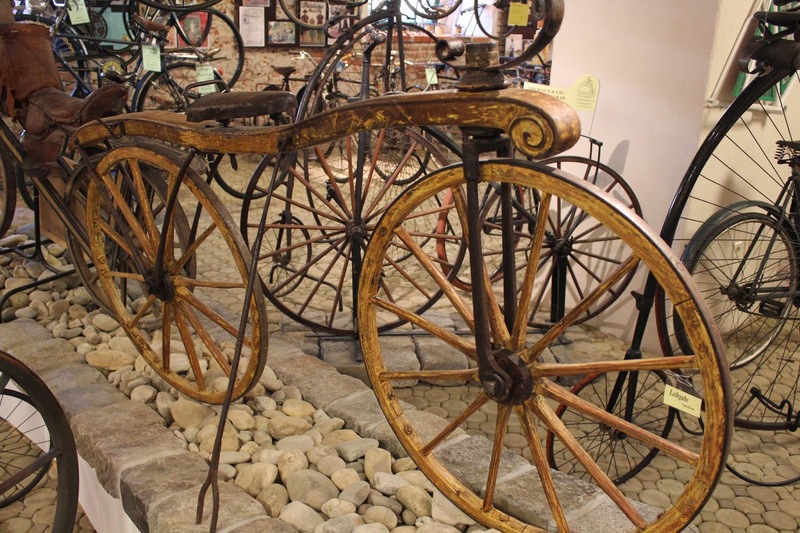 Walking through the museum one sees a number of very early two-wheelers, including a replica of Baron Drais' 1817 Laufmaschine, considered to be the first bicycle (at least in the German-speaking world! ), and several others from the Iron Age of Cycling. There are some nice highwheelers as well but the major part of the collection covers the safety bicycle, in its myriad forms. There are bicycles with weird suspension systems or peculiar drivetrains and one is again reminded of the myriad avenues, many of them leading to dead ends, of technological innovation that characterized the development of the bike. In addition to the well-known Austrian brands mentioned, there are some quite obscure ones such as Burg, Jacobi and Miesenstöck along with French, Czechoslovak and German models. Particularly pleasing is the Bismarck bicycle with its two-speed bottom bracket transmission. In the walls of the cellar there are niches which have been used to highlight objects of special interests. 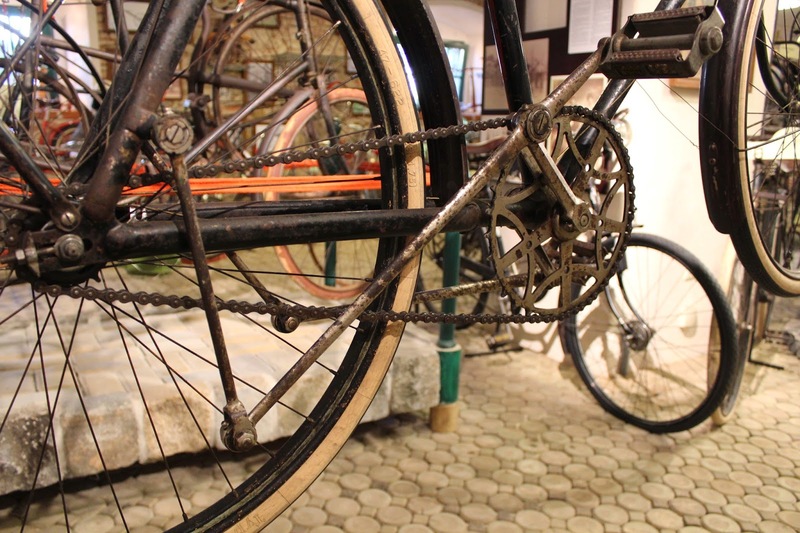 One of these features a Puch “Waffenrad” from 1915 and is devoted to the Puch story. Founded in 1889 in Graz by Johann Puch, the company was a successful manufacturer of bicycles under its “Styria” and “Puch” brand names. 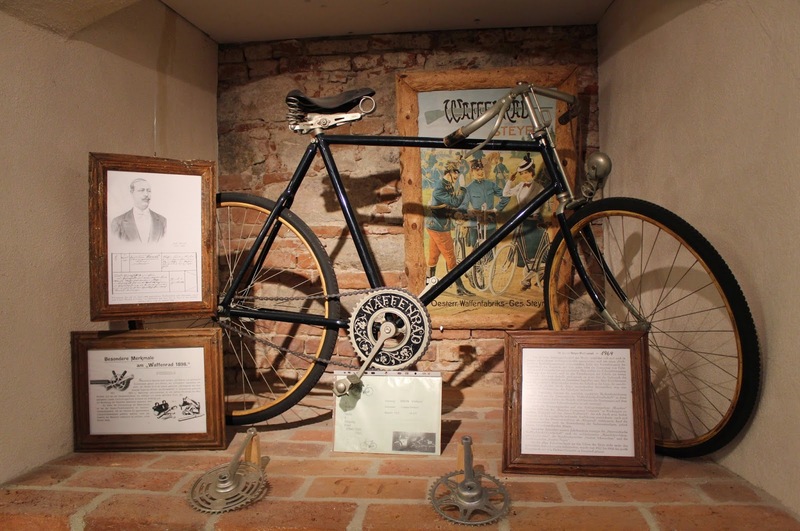 The first Paris-Roubaix race was won on a Styria bicycle ridden by Josef Fischer in 1896. In 1900 operations were expanded to include mopeds, motorcycles and even cars; by 1908 the company was already producing variable-gearing bicycles. By the time of the founder's retirement in 1912 the Puch factory was producing 16,000 bicycles annually. In 1928 the company merged with Austro-Daimler and subsequently again with Steyr in 1934. 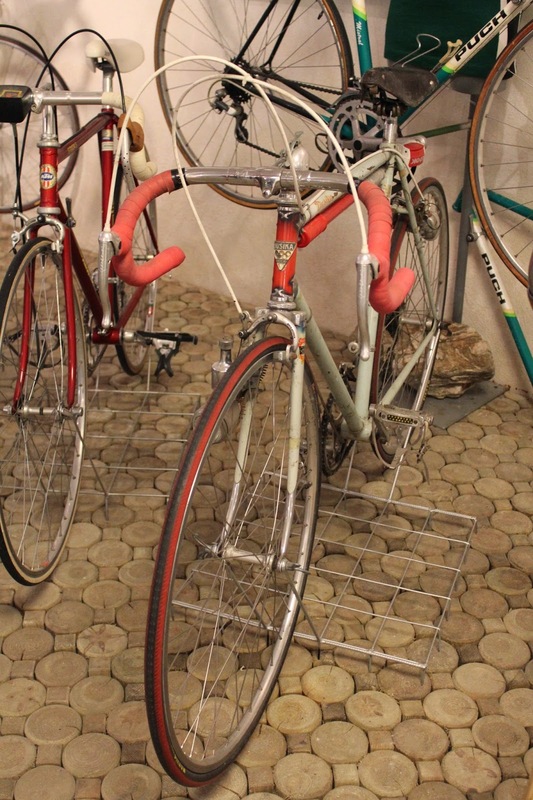 Post-World War II the company produced a very wide range and Puch bicycles were ridden to many race successes by Austria's best cyclists in Team ASKO Knittelfeld in the 1970s and 1980s but the collapse of the US export market post-1975 led to disastrous losses. The company was sold to the Italian firm Bianchi in 1987. The merged group is now part of the Swedish Cycleurope group, which includes other historic brands including France's Gitane and Sweden's Monark and is owned by the Monegasque royal family. 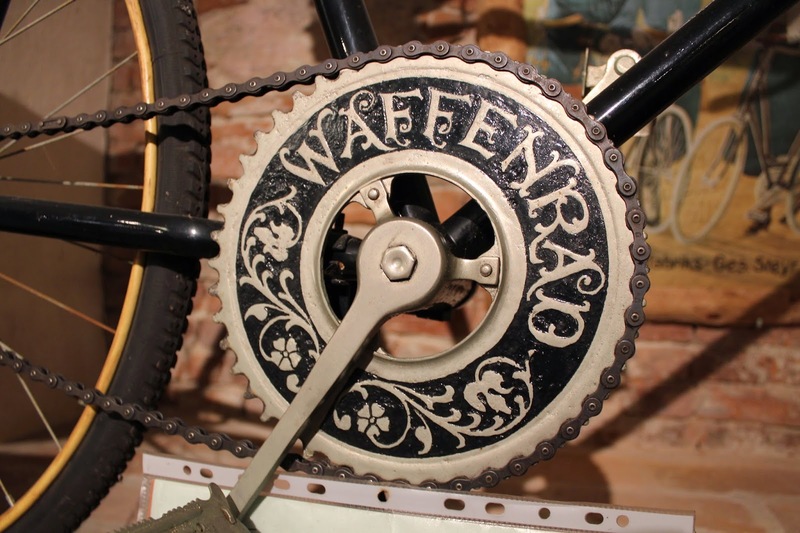 The “Waffenrad” name is still used by Puch but the bicycles do not have the unique style of the model featured at Retz with it beautiful chainring! The museum is packed with interesting artifacts although one must admit that the racing component is a bit weak. Nonetheless, everything is accessible (Herr Hurtl will move bikes for you if you want to take some photos—take that, Deutsches Museum!) and the whole project is one of great charm. 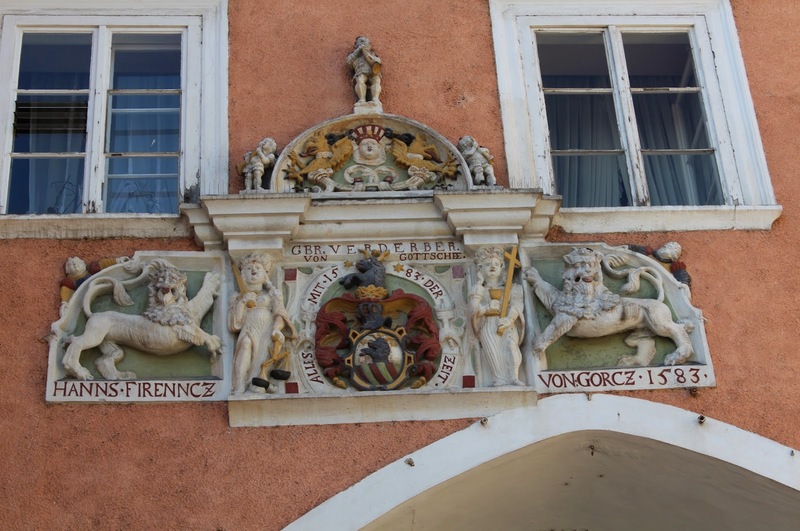 It is worth the short trip from Vienna and provides the opportunity not only to enjoy the museum but also the very attractive town and the Weinviertel, whose attractions are quite obvious. The museum is open daily from 14:00-17:00 May to October but can be visited otherwise by appointment. Admission is 3 Euros for adults.